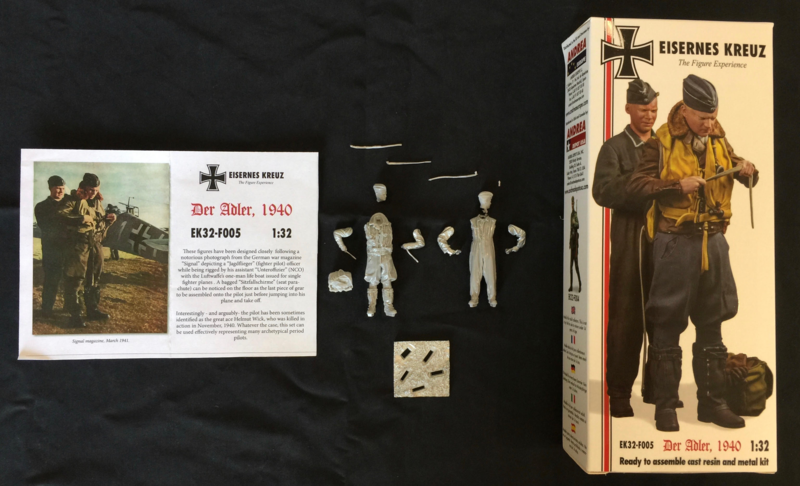 Andrea Miniatures has become known for their very fine series of Eisernes Kreuz German WWII figures. The figures are digitally created then cast in standard figure scales of 1/16th, 1/35th, 1/48th, and 1/72nd. The figures are mostly multimedia (resin and white metal) with multiple parts depending on scale. The line currently stands at 10 different figures in multiple scales. Within the line is a figure that is somewhat of an anomaly. 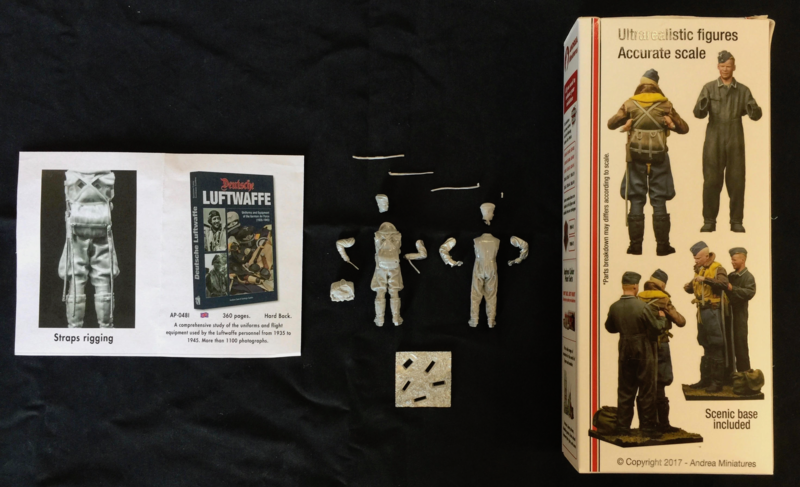 Andrea Miniatures EK32-F005, Der Adler, 1940, a two figure set, sticks to the scales of 1/16th, 1/48th, and 1/72nd. However, rather than including the figures at 1/35th scale Andrea has created a nice set of figures for the 1/32nd scale aircraft modelers. These two figures have been designed closely following a photograph from the German war magazine “Signal” depicting a “Jagdfleiger” (fighter pilot) officer while being rigged by his assistant “Unteroffizier” (NCO) with the Luftwaffe's one man life boat issued for single fighter planes. A bagged “Sitzfallschrime” (seat parachute) can be noticed on the ground as the last piece of gear to be assembled onto the pilot just before jumping into his plane and taking off. Interestingly, and arguably, the pilot is sometimes identified as the great ace Helmut Wick, who was killed in action in November of 1940. Whatever the case, This set can be used effectively representing many archetypical period pilots. *From the Andrea Miniatures flyer included with kit. All the following information applies to the 1/32nd scale kit (EK32-F005) only, the other scales of this kit will vary in part number and media. The figures fit nicely on an base included in the kit. This kit is a muti-media kit with the pilot and mechanic bodies, heads, and pilot's parachute cast in resin and the figures arms, straps, and base cast in white metal. Altogether there are 13 pieces, including the base. The casting are sharp and require very little clean-up. I would definitely suggest that all parts be dry fitted before attaching, especially the assistant's arms. One of the questions I had was the accuracy of scale.Were the figures really 1/32nd or 1/35th scale relabeled as 1/32nd. I can say that comparing the Der Adler figures to the 1/35th scale figures in the Eisernes Kreuz line there is a definite difference in scale and the 1/32nd designation is accurate. As a way of assuring the proper arms and heads attach to the correct figure Andrea has used square and round keys on the parts to designate each figure.The square keys belong to the pilot and the round keys to the assistant. The kit is packaged in the standard Eisernes Kreuz card box with multiple views of the figures on the front and back to serve as an assembly and painting guide. Inside the parts are secured in a padded study cardboard sleeve with the smaller parts sealed in little plastic bags. Included is the helpful standard Andrea painting guide along with a specific flyer dedicated to the Der Adler Figures. The flyer has a brief historical description of the figures (included above) with a color picture of the Signal magazine photograph and a picture of the pilot figure from the rear for the proper placement of the straps. This kit is a great addition to the Eisernes Kreuz line and a welcome addition to the 1/32nd scale German aircraft modelers. The Andrea Miniature's Der Adler figures posed alongside a 1/32nd scale Bf-109 will create an iconic diorama of the German side of the Battle of Britain.